So true! Have you ever noticed new ideas popping into your mind while you are working on a project? That’s usually when I get inspiration for new felted pieces or yarn colors. And the beauty is that Creativity is endless! There are more ideas around every corner. The well is never dry! Literally! Nothing inspires my creativity more than nature. Go to the old Google machine and search ART, then look at the images. That’s how I found this incredible kimono made of glass! – Do something completely new! Altering your routine can refresh the mind. Have a fun week, my friends! 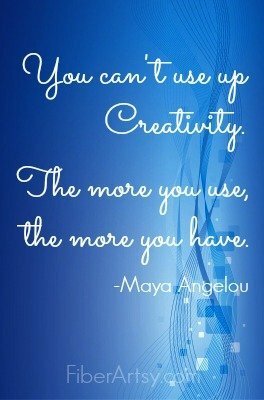 What do you do to inspire creativity? ?